This post is super hot :) Just tried this cake a while back and could not resist posting it immediately. I wasn't in good mood this morning. Have been dead dull and inducing my mood to rest at home too. Sometimes life isnt as happy as the fairy tales! :( Grrrr nothing happens as we expect and I hate bad surprises. 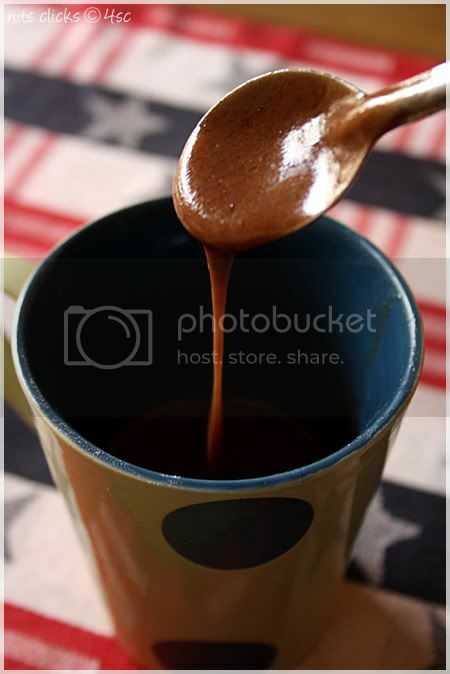 In a microwave safe coffee mug, mix together all purpose flour, sugar, cocoa powder, cooking soda and salt. Add oil, vanilla essence and milk to it and stir well with a spoon until it becomes a smooth batter. See to that it does not form any lumps. Finally add the chocolate chips and give it one stir. Microwave this at 900W(max power in my microwave) for 2 mins. Check it out after 1.5 mins and if the cake looks still wet go ahead with another 30 seconds. The timing is subjected to your microwave settings. The cake would initially look puffed up but would drop down once cooled. This cake is baked in the microwave mode and not in convection mode of the microwave. Make sure if your coffee mug has "microwave safe symbol" at the bottom of your coffee mug. To make vanilla cake you can skip cocoa and increase the cooking soda by a pinch. This is because cocoa by itself has raising agents. Hence skipping it will require some more of cooking soda for the cake to raise. See to that the batter occupies just half of your coffee mug. You can top the cake with some fresh cream or butter cream. 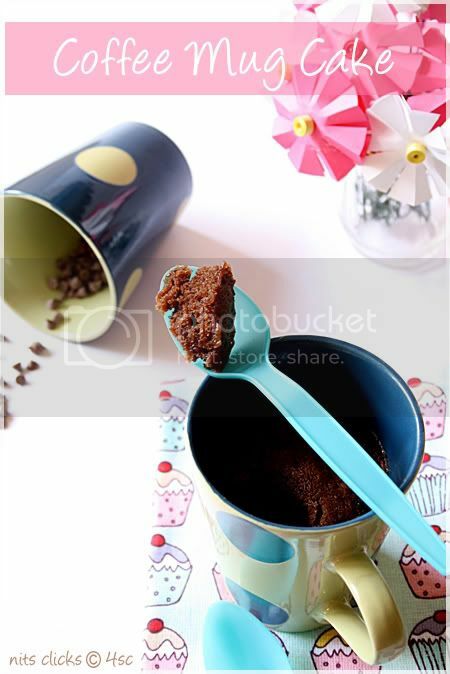 I love this instant and quick yummy cake, beautiful clicks..
lovely microwave version cake looks perfectly baked and very chocolateeeeeeeee. Fantabulous looking cake. Simple and classic. Will definitely try it out once i get a new Oven! Nice pics! Kya bath ,kya bath,kya bath..! I desperately need this.It is that bean that makes wonder.I liked it is eggless. had seen a couple of one whole egg in.When we are upto doing this case,one would def not wait to frost it..! 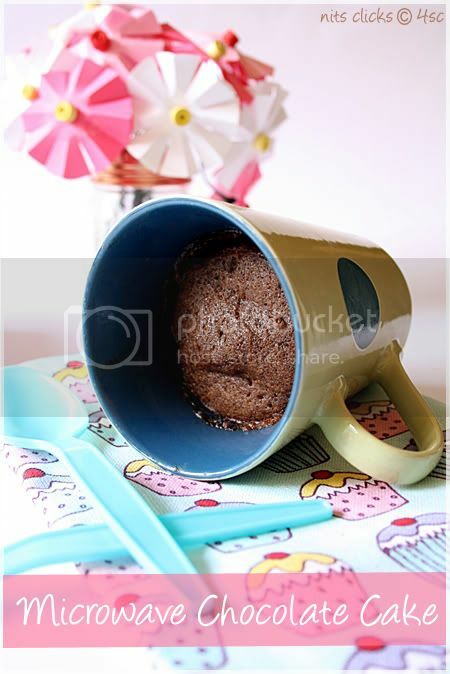 I've heard so many rave about the MW mug cake but never tried making it myself.Chocolate is a great mood uplifter and I am sure you are back to your chirpy self now!! Your cake looks good.Mine did not turn out that great.Maybe I shud try your version. wow,actually I thought cake in microwave wont come moist,but I changed my mind,will try out once,as we can make in less amount :)clicks are cool nithi! Great clicks Nithi. the cake look s very moist too. will definitely try it out. Perfect to make anyones day.... loved the pics ! I love these instant dessert to satisfy the sweet cravings...Sure baking is a mood lifter. we all love this magic mug cake in my house. its amazing to make cake in 5 minutes. I have tried adding coffee, cinnamon and plain cake. every time its different. you have clicked beautiful photos. Microwave cakes look so delicious and inviting. Would definitely try out this simple recipe at home. Cake looks tempting.. very simple microwave recipe.. thnx.. Instant and yummy cake,looks fabulous. 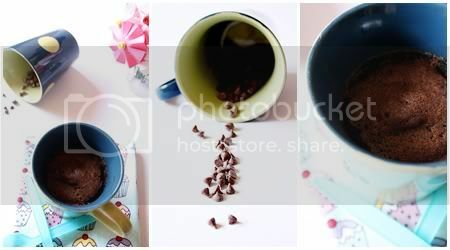 Agreed this is the best way to indulge quickly..I had made it few weeks back..pictures look yum! 2 min cake... looks ans sounds yummy.. This is one of my keeper recipe... Would definitely try..
y u feel low?...Enjoy the singleness to the core...Coffee Cake in Coffee Cup? ?...hmmm....yummm..I was planning a post on this microwave mocha cake too..Great minds still thinking alike.. 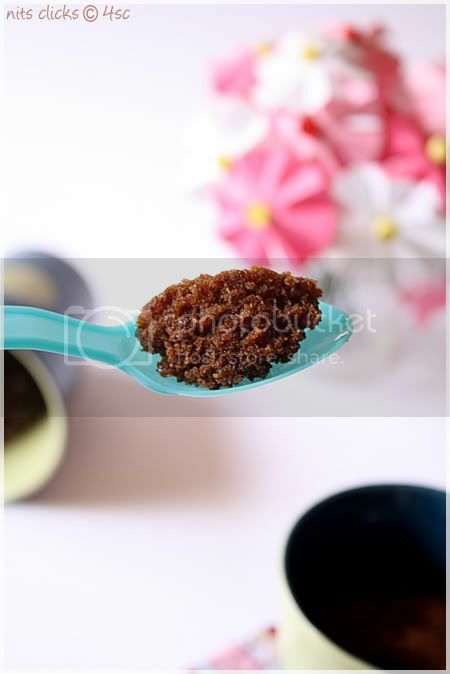 I love this instant cake in MW> I make it with coffee powder. ok, now I too have to make it, beautifully done. Wow cake looks super moist and yummy..and lovely clicks Nithya. Isn't that the best way to fulfill ur chocolate craving? Just microwave for a few minutes and a yummy cake is in front of you! I love it! since i dont have an oven i can stick to this recipe and this will be a great treat to my daughter who loves cake.. Clicks are pretty. I can't wait to show this to my daughter. She can make her own cake and I can eliminate calories! Since long time I did not do this.. (I make this when i was in singapore) I usually do this when we badly want to eat dessert after dinner :( This is sure a quick and satisfy our cravings for chocolate. Pictures are great asusual Nithi. Hope your mood are ok now :) Enjoy !!! These instant desserts scare me just coz I know I'm going to make them quite often and eat all by myself! Looks nothing but perfect as always. Lovely! !I must try this soon.This is so simple and looks moist too!! Wow! !Niti, wonderful. I can try this becuase i am new to baking and i dont have convention microwave too. will be a hit among kids. Love ur microwave version cake, yum and decadent. Even I prefer my cakes eggless when it's free from icing sugar decoration... else don't like the smell! But your idea of adding chocolate chips is great! I'll try! Yummy cake, Nithya. And loved that bit about reversing "stressed". Way to go! Hi..the cake looks too good to be true coming from a microwave ! I am keen to try it out but have no cocoa powder, was thinking if can use chocolate syrup instead and make a choc. version? Do you think that would work? I think I am going to stick to your version, buy cocoa powder and try it out first then maybe experiment with chocolate syrup the next time around..will let you know how it turns out..
one of the easiest ,yummiest microwave cake .imediately tried after reading . my son also loved it . I just bought a microwave yesterday and your was the first recipe I made in it. Very simple and came out very well. Though it's a li'l dark for my taste. It kinda got a little hard after sometime, is there a way to keep it soft?? i'm new to this blog...while i was surfing through i was excited when i read this recipe and even more when the cake turned out as told. i loved every bite..thank you for this wonderful recipe. Itsss jstttt yummyyy....i tried it today & it cm out wwoooo...so yummy..really.I JST LOVE IT.Thanx 4 ur recipe. It sucked! I made it and it was so bad, it became all rubbery with oil dripping. Eww. Just tried it and it was the best microwavable cake I've ever had! My cake turned bitter Nithya, wondering if the 2 Tbsp cocoa was a bit too much? I love this! So chocolatey and I never would've guessed it was made in less than ten minutes. Tried this 2min cake and it turned out so well. Very happy. Keeper recipe. My daughter too loved the taste and texture.Now I can add one more item to her small break box.Thanks. I've been searching 'easy cake recipe' for blue days.I'm soon trying it. Hi, i made this today and it came out quite well. just want to know how much maida to use for plain vanilla cake, thanks. Mind blowing .. I cooked the cake today and it was done in 1.30 minutes flat. Really yummy and fantabulous. Can we make this cake in glass..? I just tried now this cup cake & so impressed that within 2 mins cake was done. I just waitting if little colder then I have it with vanilla ice cream. but that time cake is so hard like cookies. Why it happened can't understand. Pls give me some advice how it w'll be soft if have it after sometimes later. Tries this just now. Amazing!Just one and a half minutes and the cake is done. Great dessert idea! I followed the exact recipe, added white chocolate chips and kept in microwave for 90 sec. It turned out amazing. If you live by ur own, this with a cup of milk is your best companion! nithya..any suggestions?how about substituting oil with melted butter? But the cake turned out so yummy and spongy.......thanks for satisfying my taste buds! Its a super-duper instant hit!! Can you keep the cake? or does it have to be eaten straight away? I made one tonight, and topped it with a bit of... flavored liquid coffee creamer. :-) Incredibly easy, and ideal to make especially during warmer weather, since it doesn't heat up the kitchen. Try to run the first very well! Replace sugar I with a tablespoon of honey, and oil with white butter; forgot to add vanilla essence. today i made it in silicone cups so turned out wellshaped cupcakes and spongyyy too..loved it and will make more by this microwave version..thanks for the recipe..
convenient sofa and fold out high bed, queen size bed all in one. Order now air sofa 5 in 1 online.